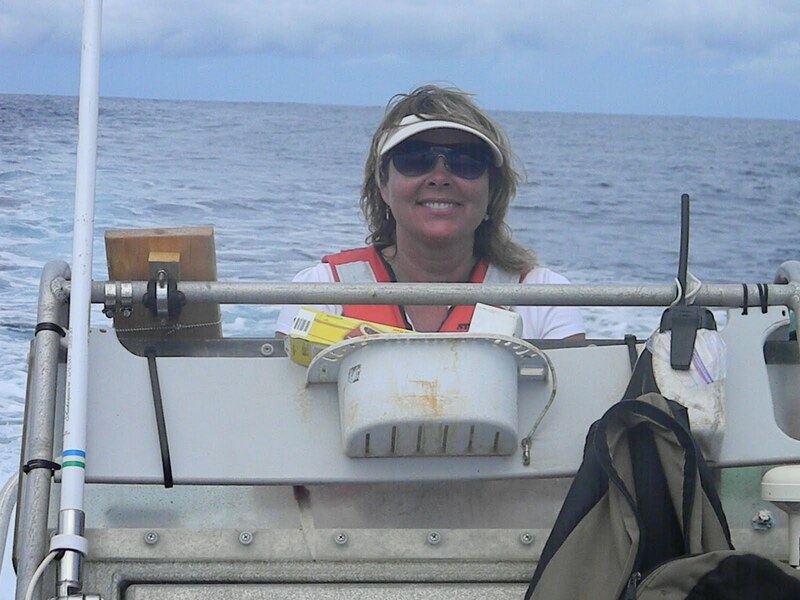 Back in the boat trying to get a biopsy from pilotwhales. Female Great Frigatebird is a large bird with a wingspan up to 86 in. They do not walk or swim and are the most aerial of the seabirds. The Northwest Hawaiian Islands became a Marine National Monument called Papahanaumokuakea Marine National Monument. Papahanaumoku is a mother figure represented by the earth. Wakea is a father figure represented by the sky. They are the honored and highly recognized ancestors of Native Hawaiian people. Together they resulted in the creation of the entire Hawaiian archipelageo and naming the Northwestern Hawaiian Islands after these names to strengthen Hawaii’s cultural foundation. 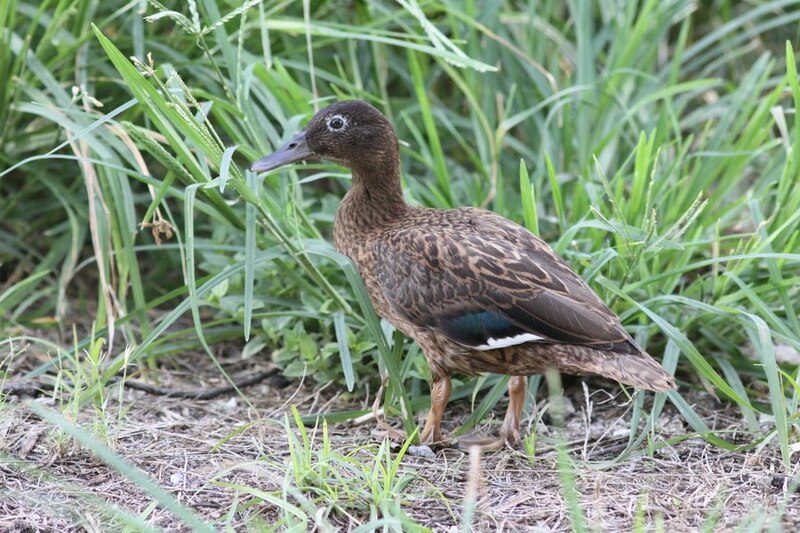 Layson ducks are only found on Laysan and Midway. They were near extinction from hunting and invasive species, now they are protected and their numbers have increased to over 500. Papahanaumokuakea is considered a sacred area. Native Hawaiians believe that life springs from this area and spirits come to rest there after death. That means they also believe that they are descended from the same gods who birthed the Hawaiian Archipelago and it is therefore their responsibility to become stewards to care for the natural and cultural resources in Papahanaumokuakea. 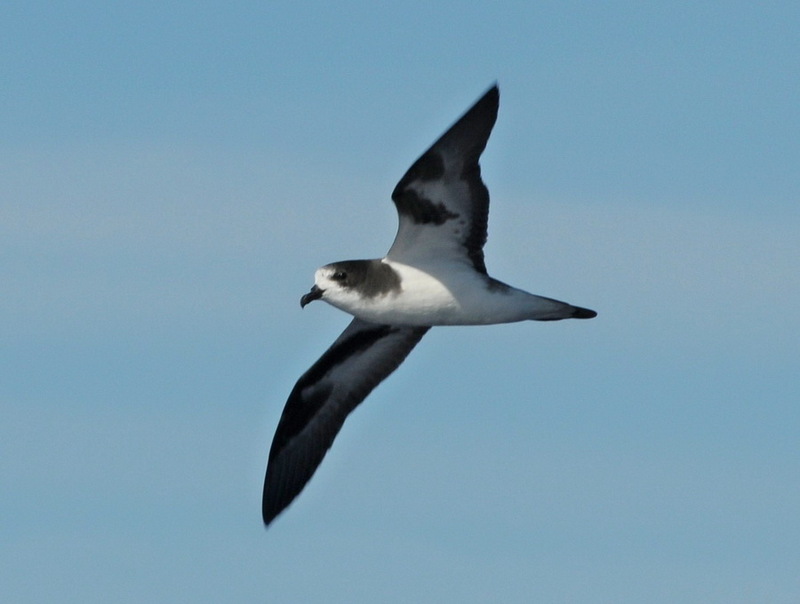 Short-tailed Shearwaters often fly in flocks. These birds were on their migratory route. The HICEAS cruise has track lines that cross into the National Monument, so while in the Monument, we must abide by the rules set forth to protect the natural and cultural resources within. This area is indeed rich in life as well as tradition. Over ninety percent of the Monument’s area is deep sea. Some depths are greater than three thousand feet. Hawaiian monk seals may travel more than one thousand feet down into the ocean to feed on gold and bamboo corals. Some of the corals are over four thousand years old. Scientists are just beginning to understand deep sea habitats such as that of sleeper sharks, hagfish and crabs. Even though there is not much land within the monument, many animals make it their home. Over fourteen million seabirds of twenty-two different species breed and nest in less than six square miles. The reason these islands are so populated is because of the island’s isolation and conservation measures. White tern on Midway. 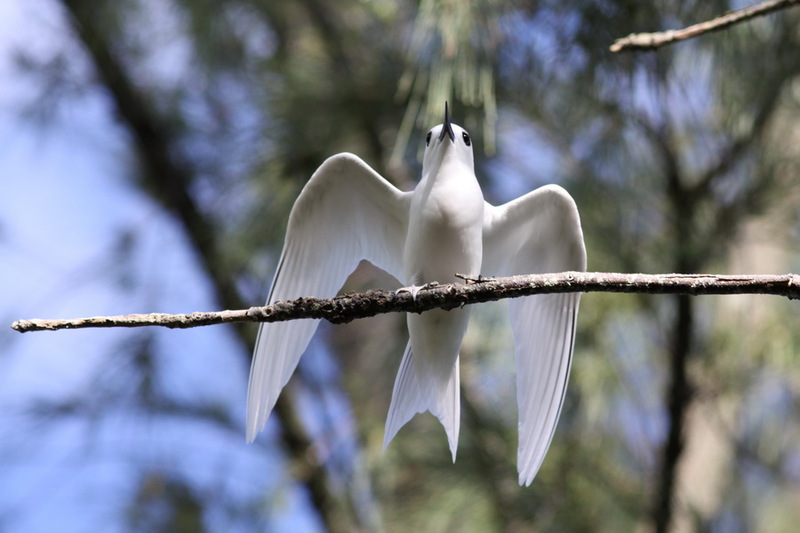 The oldest White terns on the island are 50years old! The greatest threat of the Monument is climate change. An increase in sea surface temperature is linked to disease and coral bleaching. Rising sea levels cause less land for green sea turtles, monk seals and seabirds. The HICEAS cruise has documented thirty-seven species of seabirds. Not all of these birds live on the islands, many are migrating. Within the “tubenosed” , Procellariformes order, there are the Petrels and Shearwaters. The Petrels include the Kermadec, Herald, Hawaiian, Juan Fernandez, White-necked, Back-winged, Bonin, Wilson’s Storm, Band-rumped Storm, Cook’s, and Bulwer’s. 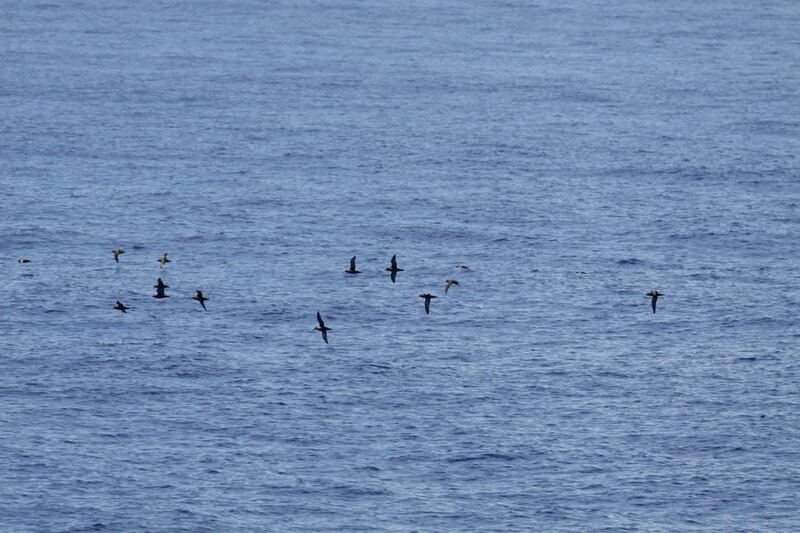 The Shearwaters include the Christmas, Wedge-tailed, Buller’s, Sooty, Short-tailed, and Newell’s. Bonin petrels are coming back to their burrows on Midway. The burrows may be 9ft. long and 3 ft. underground. From the order Pelicaniformes the Red-tailed and White-tailed Tropicbird have been recognized and also the Brown, Red-Footed, and Masked Bobby. 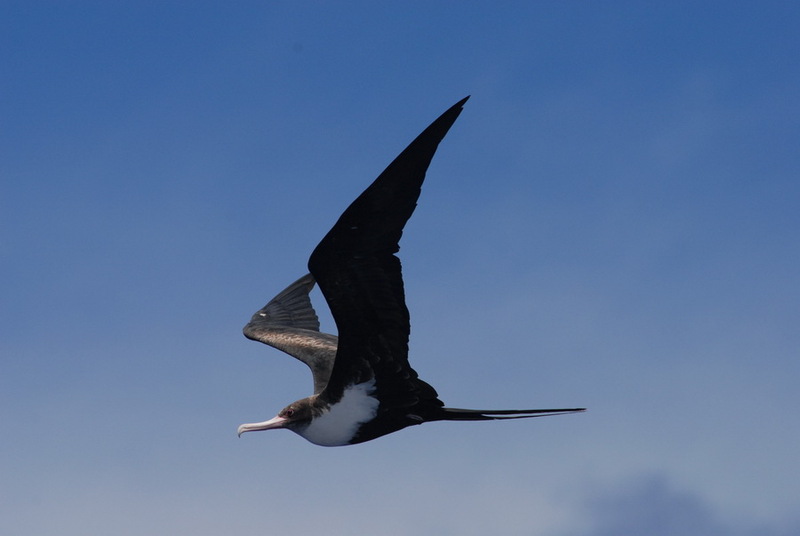 Great Frigatebirds, the largest of all within this order, have also been seen soaring high above the ocean. A third order is the Charadriiformes, the shorebirds, terns and jaegers. The HICEAS track line is bringing us close (within three miles) to the shores of atolls and islands so therefore shore birds are seen as well. The shore birds seen so far are the Bristle-thighed Curlew, Pacific Golden-Plover, Red Phalarope, Ruddy Turnstone, Bar-tailed Godwit, the Brown and Black Noddies, the White, Sooty, and Grey-backed Terns, the Pomarine, Parasitic, and Long-tailed Jaegers, and the South Polar Skua. The HICEAS cruise will agree with the National Monument in proclaiming this area has an abundance of seabirds! The bottom view of a Wedge-tailed Shearwater. Like most seabirds, they mate for life. 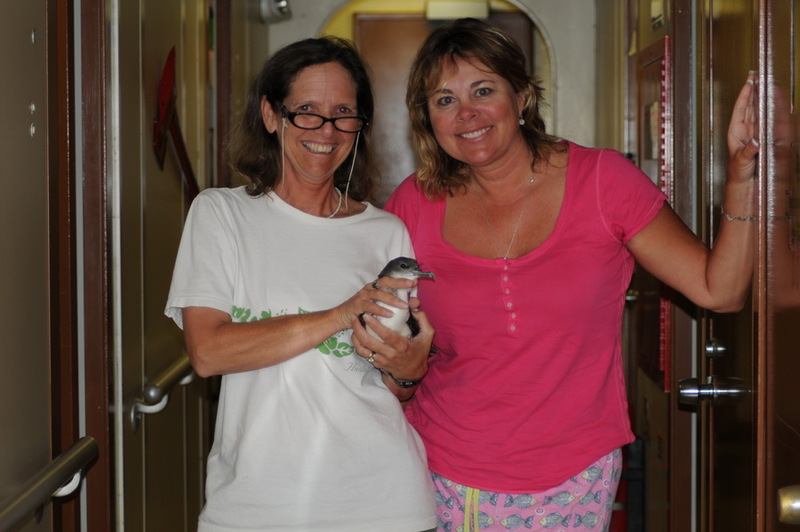 My roommate or “statemate” (on ships there are no bedrooms rather staterooms) is Dawn Breese, she is an avid Birder. Scott Mills, also a Birder mentioned in Log #2, have been noticing a trend in their daily bird population densities. As we headed northwest, they noted on September 17, 2010 when the Sette was at 28○ 24.7’ N and 178○ 21.1’ W, they saw their last Short-tailed Shearwater. They did not see any Short-tailed Shearwaters after those coordinates and felt that it was odd considering the large amounts they had seen previously. Near the International Dateline past Kure we headed back southeast once again and the Short-tailed Shearwaters reappeared at 27○ 6.28’ N and 178○ 27.9’W. They concluded that they had passed twice through the Shearwater’s migratory route and seemed to find its NW edge. On a single day alone, they estimated that there were over fourty thousand birds in that area! 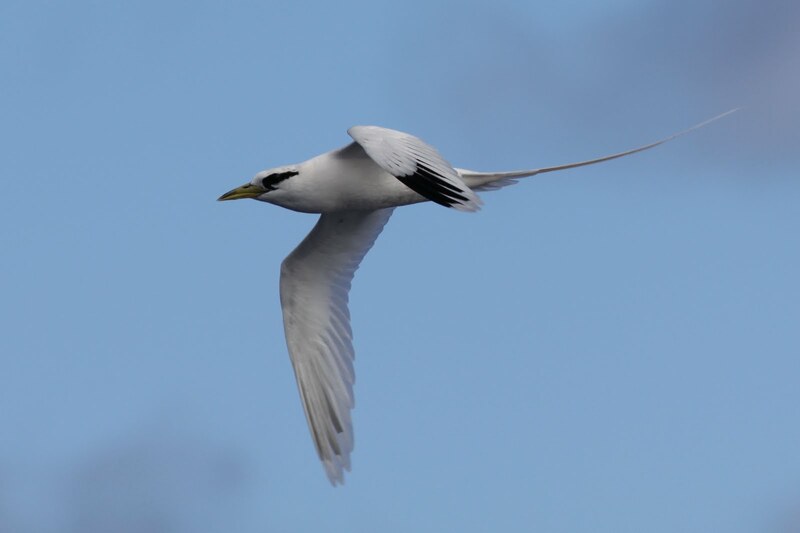 White-tailed tropicbird likes to plunge dive for fish and squid. When they mentioned the huge numbers of Short-tailed Shearwaters they saw, I decided to do some checking on them. I discovered the Short-tails are about forty centimeters long and have a wing span of 100 centimeters. It is chocolate brown with a darker brown cap and collar. It is often observed in large flocks and will dive fifty meters into the ocean for fish and squid. 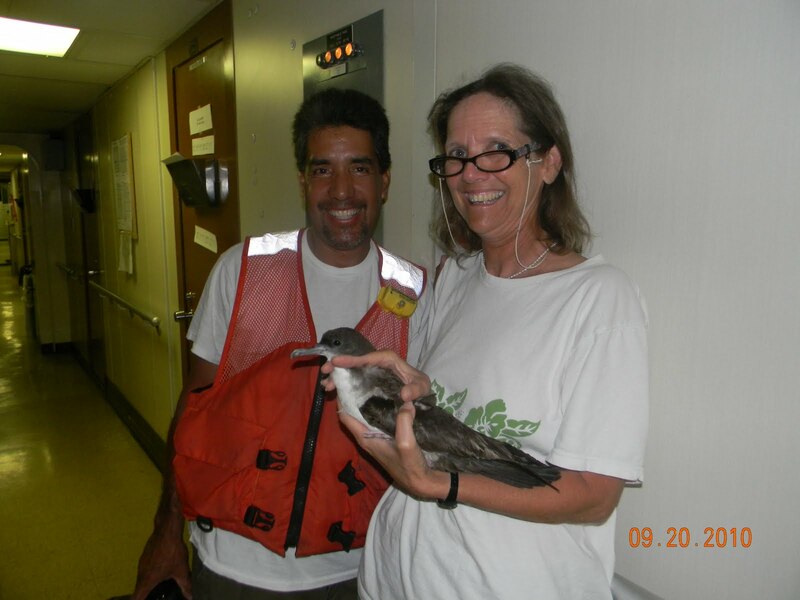 Juan Carlos brought the Wedge-tail Shearwater down for Dawn to see. 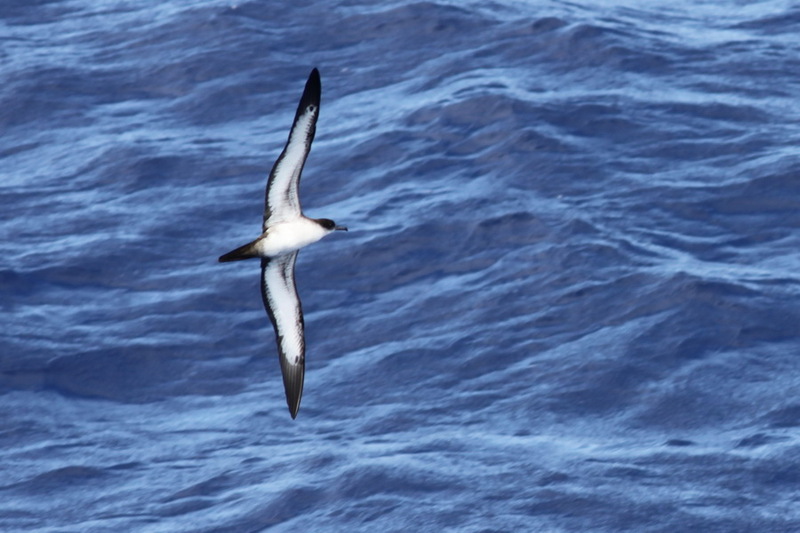 The Short-tails breed on islands off southeastern Australia and migrate north to feed in the Bering Sea. The Sette crossed their route flying back to the South Pacific! It is a good thing they are “tubenosed” because they will not land until they have reached their destination. The “tubenose”, (mentioned blog #2), will help the birds eliminate salt from their bodies. Some short-tails on the breeding grounds will actually commute to the Antarctic to feed on fish along the ice. The Wedge-tails tubenose is on the top of the beak. On September 20, 2010 Juan Carlos knocks on our door after sunset to show Dawn a Wedge-tailed Shearwater, cousin of the Short-tailed Shearwater. The nocturnal animal got distracted by the ships’ light, and ended up on deck. 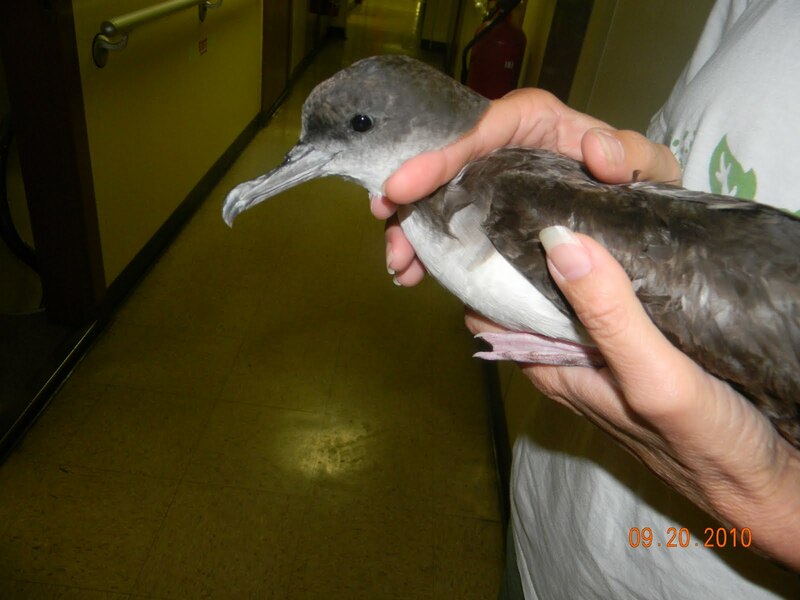 According to the Hawaii Audubon Society, Wedge-tail Shearwaters on O’ahu are often hit by cars because of the car’s lights at night. O’ahu and Kaua’I both have rescue shelters for hurt birds from car accidents. The Wedge-tail posing with Dawn and I.
Juan Carlos rescued the stunned bird, making sure it could not bite him with its sharp beak, and brought it down to show the bird observers. I took close-ups of the bird because I wanted a picture of its tubenose. Dawn showed me the unique features of the Wedge-tail. It smelled fresh like a sea breeze. We looked for the small ears behind the eyes but it’s feathers were so dense we couldn’t get a good look at it. The bird had light brown feathers with a white belly, it was very soft and dainty looking. It didn’t seem to mind people staring at it within a ship, but it probably just seemed content because Dawn knew the correct way to hold a bird. After the Wedge-tail was checked out, Dawn took it up to the fantail (back) deck and released it. The bird flew away unhurt into the night. Today is a bit frustrating for the science staff since we are delayed in our departure; although the crew doesn’t object to another day of restaurant meals and visits to town to make final purchases. This gave the science and navigation team time to get up to speed on the cruise track, and view satellite images of what is happening offshore, and to determine the first waypoint of the ship – Point “Alpha.” Alpha is at -20° S, 075 W (That will put us 130-miles southwest of Arica, 1200-miles south of the Equator, and in 4,000-meters of water.) We will be at the same Longitude as Philadelphia, PA. Surface and subsurface sampling of the sea and air is to be done at the same time air samples are captured by several aircraft passing overhead at different altitudes. Low passes by a slow-flying US Navy Twin Otter will take samples at the “boundary layer” where particles of salt spray and other particles are cast into the air by wave action; while higher passes are made by a much larger C-130 operated by the National Center for Atmospheric Research. Simultaneously, meteorologists on the ship will be launching SONDES (Weather Sounding Balloons) that collect data on the air temperature, humidity and air pressure up to about 25,000 meters; and oceanographers will be taking water samples with a CTD meter (Conductivity, Temperature, Density) at the surface and down to 3,000-meters. “One hand for the ship and one hand for yourself.” Onboard, the 3-Point Rule is in effect. Even at dock the ship can move, so you should always have three points of contact. (Two feet and at least one hand on a railing.) “Only YOU can prevent…!” Fire, not drowning, is the biggest hazard on a ship. Smoking is only permitted in the designated area outside the ship and at the stern. 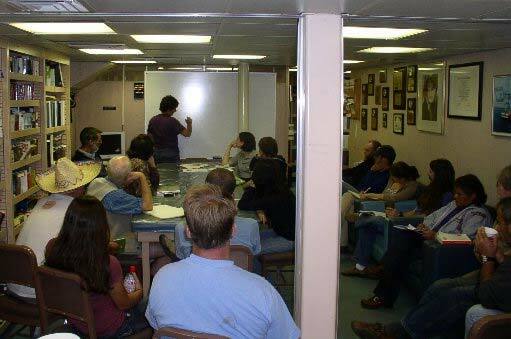 “If it’s too hot, stay out of the kitchen!” This is an open ship, but for obvious safety reasons and to avoid interfering with operations, certain places like the engine room, machine shop and galley are generally off-limits. Inform the bridge of your activities and always wear your safety vest and helmet while on the fantail. “Wash your hands!” Living in close quarters requires good hygiene. Wash frequently since you are constantly touching doors and railings. Immediately report any injuries to the health officer “Doc.” Know the signs of seasickness and immediately seek attention if you feel dizzy, nauseous or groggy. Stay hydrated. The Galley staff serves dessert -sweet potato pie! “Eat it and beat it!” To paraphrase that old Army saying, a ship sails on its stomach too, and the first order of the day was food, meal times and consideration of the galley staff. 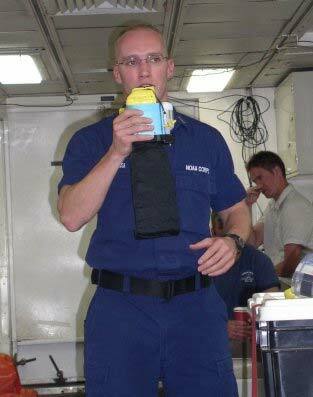 Meals are closely spaced and on a tight schedule because of rotating schedules (Someone on the ship has to be maintaining power, scientific equipment and our course every minute.). Also, the kitchen is in a constant state of clean-up and prep for the next meal, which means the small staff must start at “0-Dark-Thirty” hours (Well before dawn) and is not finished until evening. Mealtime is not the time for chit-chat. Eat and make room for others who are coming off duty. Many WWII veterans admit that their motivation for joining the Navy was to be assured of warm chow. (And a dry bunk instead of a foxhole!) Regardless of your culinary tastes and dietary needs, they are met at every meal on this ship. The cuisine…in a word? Excellent! For those who are tardy, sleep late, like to spread out their meals, or are delayed because of a sampling conflict or problem in the lab; the cooks are always considerate enough to leave out fruit, soup, leftovers, world-class dessert (On the rare event that any is left) and predictably, the old standby – peanut butter and jelly. “The two-man rule” Any doctor will tell you that nothing is better for allergies than an ocean cruise, and the air here between the desert and sea is very refreshing. However, in the confines of the ship we must be aware of gases like Nitrogen and Helium that the scientists need to operate analytical equipment, and since the ship has large and powerful engines, Carbon Monoxide is always a consideration. 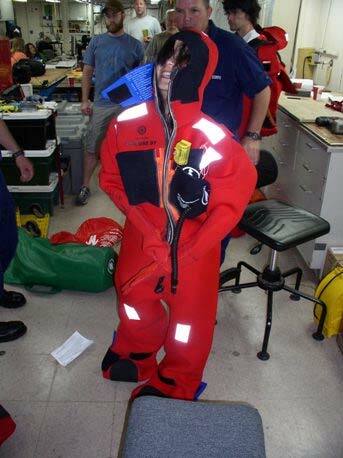 When working with these gases and in tight quarters, we were reminded to have a partner, while the Safety Officer trained us on the 10-minute rescue breathers in our cabins. Interesting observation: One sign that odorless, suffocating gases are present is that someone passes out while you are talking to them. (Certainly THAT is every teacher’s worst nightmare!). We are also issued an EEBD (Emergency Evacuation Breathing Device) which would give us 10 minutes of air to escape such a situation. Feeling informed, safe and secure, we were given one very important final tip from the maintenance crew: “Please don’t flush anything down the head besides toilet paper and whatever your last meal was!” We are ready to go to sea. There may be miles of cordage on a ship: Line (Thin rope), Rope (Thick rope more than 1-3/4 inches in circumference) and hawser (Really thick rope at least 5-inches in circumference). Hawsers are used to secure and tow the largest ships. As many as ten bow, stern, breast and spring lines, ropes and hawsers secure a vessel to the wharf. Returning to the Brown after a long day hiking around and hoping to see some unusual wildlife during our last hours of “shore leave” I noticed the gang plank was moving back-and-forth appreciably, even though the harbor was flat calm. At the beach I enjoyed watching thunderous “overhead” surf breaking on the point and speculated about what sea conditions would be like at our rescheduled Midnight departure. Back in the harbor, the circular, movement of the ship was confirmation that there was a good long period swell refracting around the breakwater and setting the port’s water in motion. Watching the ship’s lines tighten and slacken at regular intervals of about a minute, I imagined the Brown was telling us she was biting at the bit to sail! Checking the lines I realized the hawsers had become a perfect roost for Inca terns; a bird I had searched for in vain at the shore – hoping to spot at least one before the end of my trip. 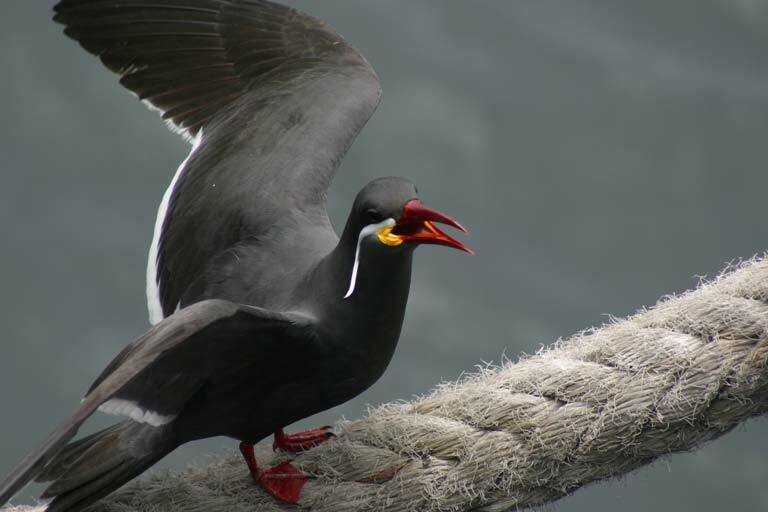 The Inca tern (Larosterna inca) is the most distinctive of this gregarious group of seabirds. Rare elsewhere, it is fairly common along the coasts of Chile and Ecuador…and becoming increasingly abundant on the Brown! At night they outnumber every other bird in the port. Birds of a feather flock together and this is certainly the case with terns. They roost, breed and fish in groups, often made up of different, but similar-looking, mostly grey and white species. Identifying them can be a challenge; except in the case of the dark grey Inca tern. Its red bill and especially its whiskered facial plumes separate it from its cousins, and all seabirds. Terns are my favorite group of birds and they have a cat-like aloofness when it comes to tolerating people. Sailing home from fishing trips in New Jersey waters, I usually have plenty of bait left over (Testimony to my questionable fish-finding ability.) and I soon learned that our common and least terns in Sandy Hook Bay are happy to dive down and perform fantastic midair catches of the bait I toss off the stern. These sharp-eyed hunters never seem to miss, and for me this is often the best part of the trip. I thoroughly enjoyed my night with the whiskered terns, photographing them and watching their behavior. 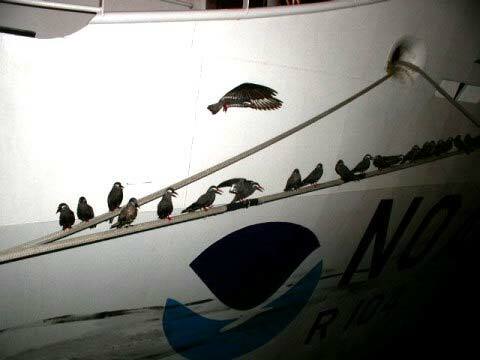 The birds were most crowded on the thick hawsers at the bow and stern. (Unlike perching birds like robins, most seabirds are flat-footed and can’t grip a perch.) There are two lines at each end of the ship (An inner and outer) and they behave differently – the outer lines stretching more but less gracefully, and occasionally shuttering. Also, the inner lines were better lit by the harbor lights than the outer lines. What follows is some of my data-driven research on the topic of Inca terns: It appears that some subtle differences encourage a definite hierarchy in the arrangement of the birds on the lines. Between 7075% of the group were adults (with their fancy plumes and dark coloration), however they were not distributed randomly. Almost all of the birds on the inner lines were always adults, and the juveniles (brown, “clean-shaven” and with less colorful bills) were banished to the outer lines. I monitored them for many hours and the whole group regularly would take off, even if only a few were disturbed (A typical tern behavior sometimes called “panic flights.”). They would circle out over the harbor, squawk a bit, and then return to sort themselves out at the lines. Adults would always jockey for space and replace any younger birds settled in the prime locations by hovering over them and making a few squawks and stabs with their bill. I never saw juveniles dislodge adults. I also noticed some courtship behavior with the terns. This involves catching a small fish and offering it to your prospective bride; and since it only occurred between adults, I assume that like the gulls at the beach, they were approaching their breeding season too. At one point before it was too dark, a large gull wandered across the parking lot and was immediately dive-bombed and chased away (More typical tern behavior near colonies). There may even have been birds on eggs inside the few select hollow openings in the wharf’s walls, since individual birds stationed themselves at the dark entrances, defending them from others that tried to land there. Hmmm…Are Inca terns cavity nesters…cliff nesters…beach nesters? 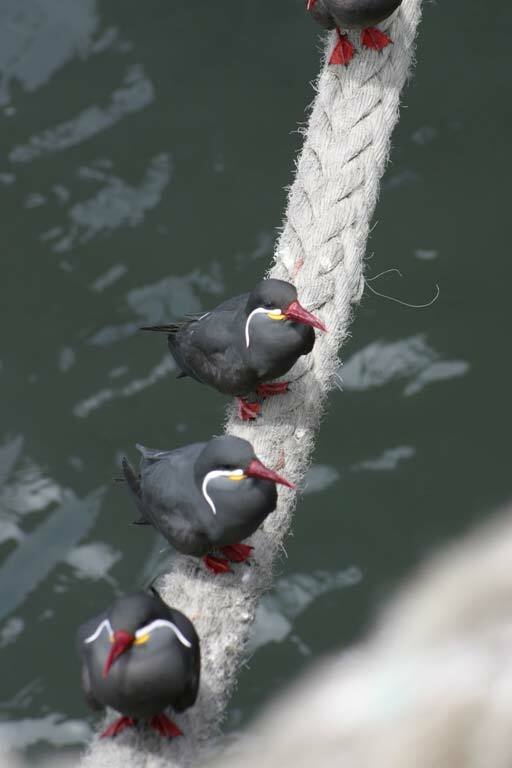 There is so much to learn about Inca terns….So many birds, so little time!